Cramer Siding & Window has been doing business in East Central Illinois since 1955. In our 60 years in the home improvement industry, we’ve helped over 30,000 homeowners, more than half of whom have been referrals or repeat customers. We come highly accredited, endorsed and recommended by your neighbors and local businesses. We are the only local home improvement company to win the Qualified Remodeler Top 500 Award 15 years in a row and have an A+ rating with the Better Business Bureau. We employ a full-time service department as well as a full-time production department, which means we do all of our own work and do not subcontract our projects. All of our installers are trained, certified and, most importantly, are our own employees. Cramer Siding & Window is part of the Prairie Home Alliance. As a company, we have been somewhat immune and resilient to the economy because we do not put all of our eggs in one basket. With Prairie Home Alliance, we can do anything from siding, windows, doors, roofing, insulation and green energy barriers, wood front kitchen cabinet re-facing, sunrooms, decks, awnings, basement de-watering, gutters and gutter protection. We have transferrable lifetime warranties and guarantees on all of our products and services. Cramer Siding & Window will work as a team to exceed your expectations. It’s both our job and our passion to provide an experience filled with prompt, courteous and efficient communication. Our team works together daily to improve our product and installation knowledge and to support those working beside us. These efforts demonstrate our commitment to providing superior products and services to our customers who have trusted us with their most valuable possessions: their homes. If we’re diligent and meet these ideals, we’ll know we’d have earned the highest compliment from you: the recommendation of a satisfied customer. 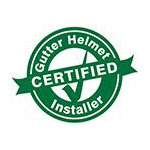 For inquiries about Gutter Helmet®, feel free to call our office today at (800) 824-3772. You can also fill out our online form to schedule an in-home assessment with one of our sales representatives.